Constructive is a Contractors Multipurpose WordPress Landing page Theme includes 11+ landing Pages Modern, Clean & Mobile Ready Design, Whether you are looking for conversion optimized landing pages, or an attractive one page Landing page/Website to run your business Constructive is the best online marketing WordPress theme you will ever need to create websites/landing Pages that deliver outstanding results and boost your conversions! 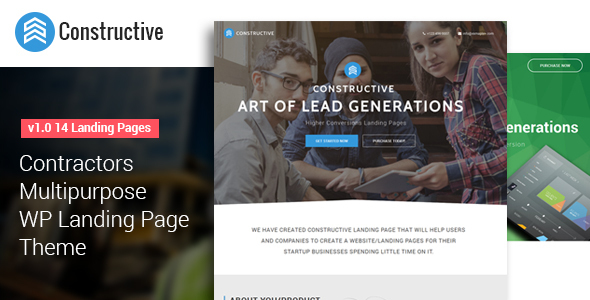 Constructive is an Ideal choice for Construction, Plumbing, Packers & Movers, Landscaping and for any other Business highly conversions landing page template. Powerful Theme Options – Lightweight and intuitive Theme Options that integrates seamlessly with WordPress, giving you complete control over your project! Animations – Animate your buttons, text, images or any of the themes widgets with different animations! Let your content fade in, bounce, flash, shake, slide and get your visitors’ attention! Parallax backgrounds – Like the parallax effect? Include this versatile effect on any row or Elements you create as often as you like! Cross Browser Compatibility – Constructive has been tested with all popular browsers for the best browsing experience.! Install demos in seconds – You want your site to look like our demos Any one of the demos can be installed within seconds. Item Reviewed: Constructive Best Multipurpose WordPress Landing Page Theme 9 out of 10 based on 10 ratings. 9 user reviews.